Opera Chic: PALOMBI< WE SAW WHAT YOU DID THERE!! PALOMBI< WE SAW WHAT YOU DID THERE!! Antonello Palombi may not be the best tenor in Italy, but he is certainly the fastest. 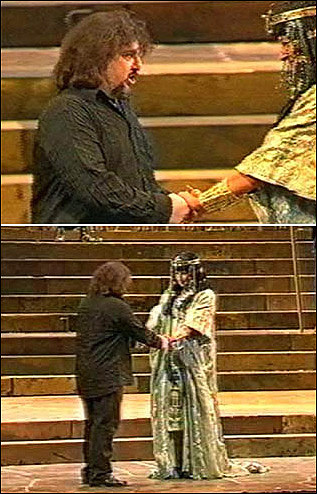 Opera Chic has learned of the shrouded circumstance to as why Palombi ruthlessly barged-up onto stage in black jeans and a long black shirt (as you see in the photo) for Sunday night’s Aida. It’s now an open secret that Palombi wasn’t even supposed to be Alagna’s replacement for Sunday night! He was actually number three for the night, and hence, was not costumed! When Palombi heard the booing on Sunday night, and figured that it was going to make Alagna go mental, he raced to the backstage area. It was from behind the wings that he out-ran the official replacement for the night, who was *already* in full costume, tenor Walter Fraccaro. La Repubblica has put up a browser-crashing film of Palombi's informal Sunday night premiere (Warning: may crash Firefox). We see here that Palombi -- a struggling tenor with a family that needs to pay the bills -- was simply an opportunist. Early bird gets the worm am i rite?